There are three basic rail shapes. 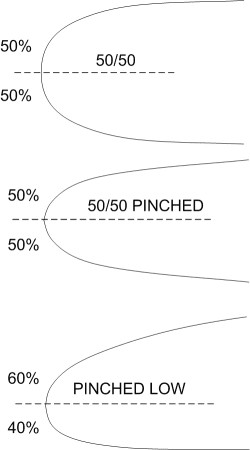 There are round or 50/50 rails, where 50% of the rail is above the apex and 50% is below. This is the classic rail shape. 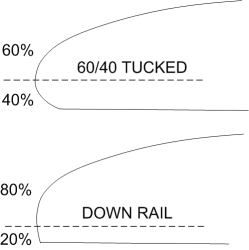 There are 60/40 rails, where 60% of the rail is above the apex and 40% is below. This is a more modern rail shape. And down rails, where the rail curves down to the bottom, forming a hard edge. The thickness or volume of a rail can be “full” (or “boxy”), regular or thin. Round or 50/50 rails can be thinned or drawn-out, so that they resemble the pointed end of an egg. These are referred to as “egg” rails or “pinched” rails. Sometimes, the apex of these pinched rails is below the centerline of the rail. They are then referred to as “pinched low”. Most modern surfboards have rail shapes which combine all three basic shapes, with a “soft” 50/50 rail in the nose, flowing to a 60/40 tucked rail in the middle and turning down to a “hard” edge in the last 16″ or so of the tail. Rules-Of-Thumb: Round rails are forgiving, 60/40 rails (especially with a “tucked” edge) give a good combination of speed and control, while hard edges maximize water release for speed.